Enjoy the deep, rich flavor of chocolate syrup, made fresh from just a few basic ingredients. You won’t run out of uses for this versatile homemade sauce! Last week I shared my adventures with Homemade Marshmallow Sauce, and you guys went bonkers! I’m so glad you were as excited about it as I was. There are a lot of things you can do with it, and I was so pleased to see by your comments how much it inspired you. 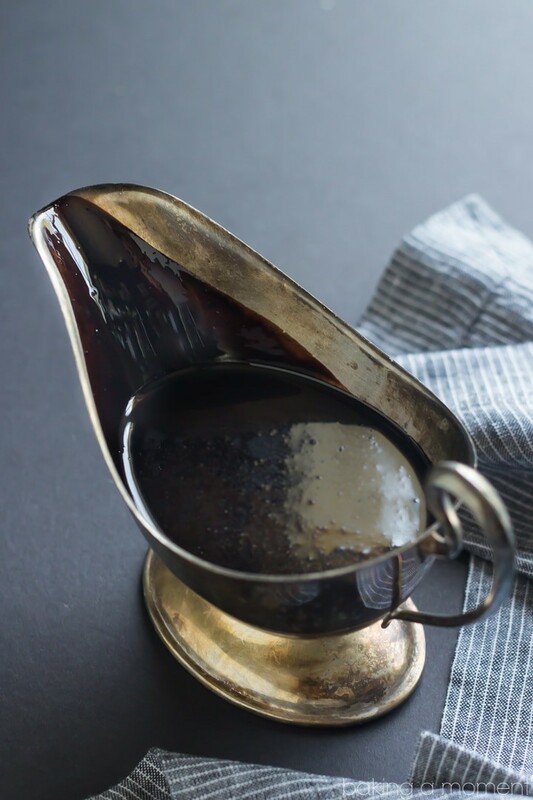 So today I would like to share another easy and versatile dessert sauce. This one is every bit as simple as the last, maybe even more so! I just love how deep and rich the chocolate flavor is in this recipe. I used a blend of natural and dutched cocoa powder, and it really gave an incredibly flavorful result. The whole thing took about 5 minutes total to whip up, and now we have a delicious sauce in the cupboard that will be stirred into everything from chocolate milk to freshly brewed mochas, and drizzled as a topping over ice cream or pound cake (or both!). I’m sure you’re probably catching on to the idea that I’m going somewhere with two sauce recipes practically in a row, but that’s a surprise for another day. So stay tuned! Enjoy the deep, rich flavor of chocolate syrup, made fresh from just a few basic ingredients. You won't run out of uses for this versatile homemade sauce! Put the water and sugar in a small pot and place over medium-high heat. Bring to a simmer, whisking, until the sugar has completely dissolved. Whisk in the cocoa and salt, and continue to cook until the mixture is slightly thickened (about 3 minutes). Next Post » Black Forest Waffle Sundaes and a Giveaway! Ok Allie, this looks just as good as the marshmallow sauce!! I think I can hear my bathing suit crying from my closet! But it’s gonna be oh so worth it! Enjoy the day! Haha, sorry! Hope you enjoy your day too Mary Ann and have a great weekend as well! I don’t really know for sure but I would imagine a good long time. After all it’s nothing more than sugar and cocoa which are both pretty shelf-stable. You are killing it with the sweet sauces! I saw the marshmallow sauce and nearly licked my screen. Now this chocolate sauce! Wowie, I could drink it! Thanks Jen! It surprised me how much better this tasted than the store bought stuff! I guess I missed the Marshmallow Sauce. How can I get it? Hey Sylvia! I linked to it at the beginning of the post. Here it is again, in case you missed it: https://bakingamoment.com/homemade-marshmallow-sauce/. Thanks for reading! My mom always made chocolate syrup when we were growing up! And I was always around to lick the pan :). Add a little corn syrup for a thicker sauce! Great tip Becky! Thanks so much for sharing! I do too! And it totally was! Allie, I love how versatile and easy each of your dessert sauces have been, and I can’t wait to see what you’ve made with them. I know it’ll be another showstopper! Aw, you’re too sweet Aida! Enjoy your Friday, my friend! I know right? Haha, thanks so much Janine! Oh dear!! This is just crazy good. And I am now waiting (in) patiently for that epic combination of these two. Can’t wait to share it! Thanks so much Zainab! ooh…that looks yum! I can’t wait for the surprise!! You are killing the sauce game right now girlfriend. First marshmallow now this silky goodness? Love! Thank you my dear! Enjoy your Friday and good luck with the segment! I just love how simple this is! I need to give up the store bought now! There’s just no need for it, lol! When you can make it seriously in 5 minutes and it tastes so much better! Thanks Ashley! No cream? Wow! I love this! Gosh I can just see it flowing over a bowl of vanilla bean ice cream, must make, must make! Yep, no cream necessary! And this way it’s more shelf-stable. I LOVED it! Hope you do too Jessica! I love this recipe!!! I need a go-to chocolate syrup!!! going to try this, Allie!!! I think you will love it Alice! I couldn’t believe how fast it was to make and the flavor blew me away! Can I just drink this as is? 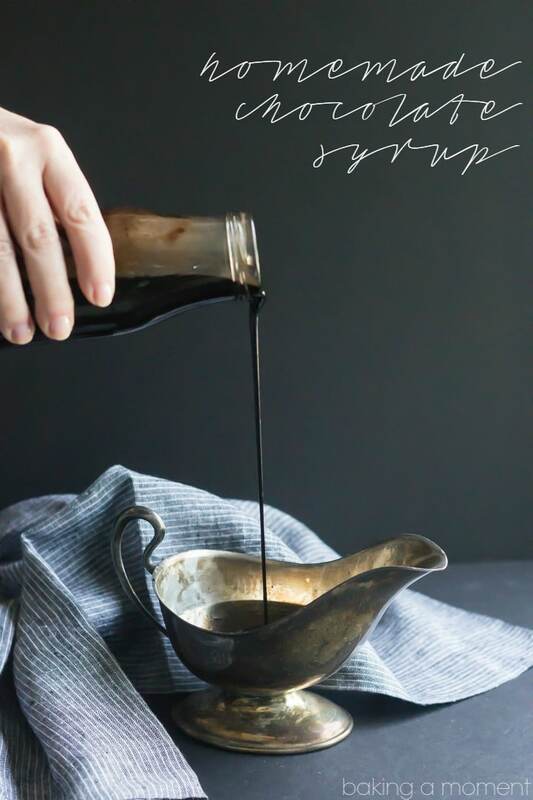 😉 I’ve never tried making my own chocolate syrup, but this sounds like something I have to do! Honestly Kathleen? I had never made it before either. But I couldn’t believe how fast and easy it was, and the flavor was way better than what I was used to. I’m a convert! Thanks Medha! I’m really excited to share. Have a great weekend dear! Wow, your chocolate syrup looks decadent and so easy to make. HOW did I miss this post yesterday! Once I’m done kicking myself, I’m gonna make this homemade sauce and pour it over everything… My ice cream, my milkshakes, my dog…(He won’t mind one bit!). Great job with this one! Hahaha hope you and your dog enjoy! Have a great week hon and thank you! 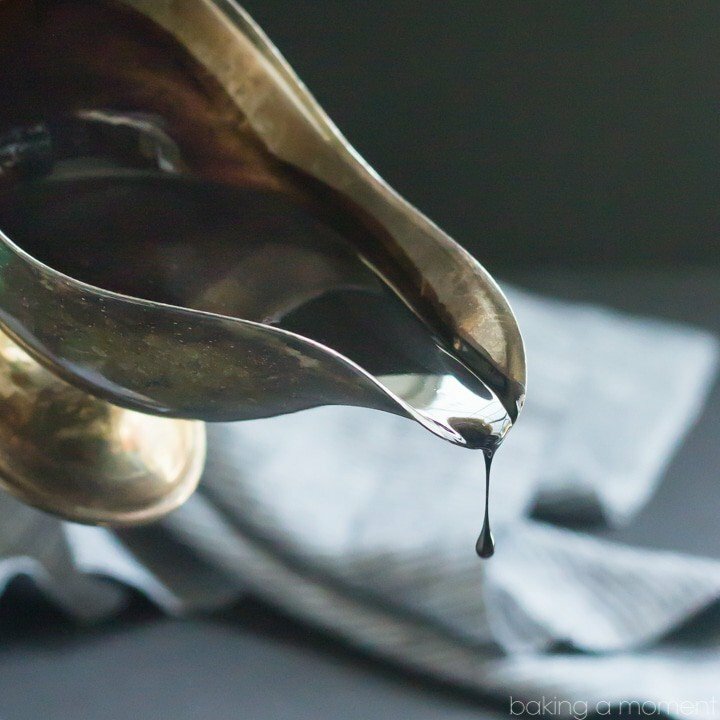 I’ve always wanted to make homemade chocolate syrup! Love it, thanks for the recipe Allie! Pinning! Awesome! Thanks so much for sharing on Pinterest Mira! This chocolate syrup looks divine, Allie! You’ve put me in the mood for an ice cream sundae, Allie!! This chocolate sauce looks perfect and I love that there are no ‘mystery’ ingredients like some bottled versions. Yum yum yum! So true Marissa! This one’s pretty simple stuff. So glad you like it! Thanks so much! I had no idea either until I tried it! It tastes so good too- perfect for ice cream sundaes! Allie, I absolutely love that first shot with the droplet of chocolate sauce coming down! This looks like the perfect thing to drizzle on top of cakes! Yes! I’ve got some leftover pound cake here that’s just begging for it! Thanks so much Lisa! Thanks Helen! I know I couldn’t believe how simple it was. There’s just no need for the store-bought stuff at all! I’m not usually a fan of the storebought syrups but I have a feeling I would love this! How did I never think to make it myself before!? I never had either! But you can bet I won’t be buying the store bought stuff again. Not when it’s this easy! I think you did it again!! Again…..and Again. I would and I did! Lol… thanks so much Emanuele! Allie! I don’t know where to start…should I start drinking it or licking the leftover chocolate? I’m sorry but I don’t think I’m willing to share this chocolate syrup with my husband. This is just too good! 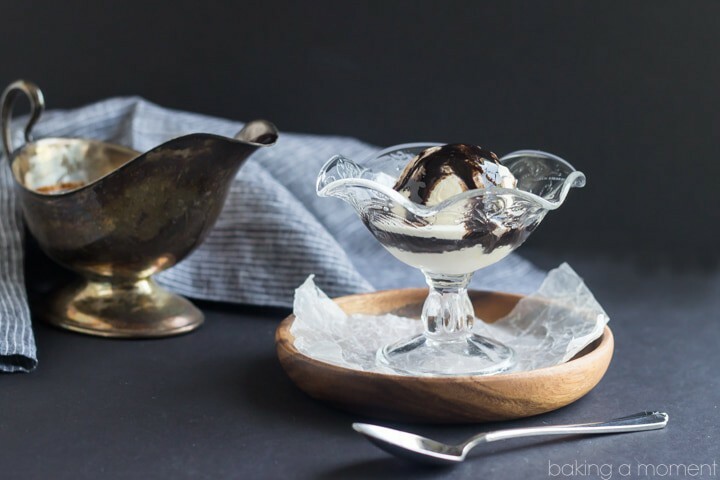 Allie – This chocolate sauce is gorgeous. It would go so well with ice cream! Yum. I can’t wait to try it at home. Girl it was fantastic over vanilla ice cream! And it makes the chocolatiest chocolate milk ever. Thanks hon! Even though I think all your recipes are total winners, your basics are always my favorites! You have the best arsenal of no-fail building block recipes and I love it! Aw, thank you so much Nora! I really enjoy them- and I feel like for experienced bakers they can be so useful because then you can go and do all sorts of creative things with them. Thanks for the sweet comment dear! Hugs to you! so rich and intense and chocolateyyyy! I love making everything homemade! Oh!that’s great, thanks but I have a query about kosher salt. What is it? Can I use regular salt which is used normally to make food. Kosher salt is used normally to make food. There are many different kinds of salt. Kosher salt, table salt, sea salt, etc. I’m not sure what you are currently using since there are so many types of salt that are readily available and it’s only up to your own personal preference what you choose to buy. You should probably try googling but here‘s a good starting point that can hopefully help. Good luck!